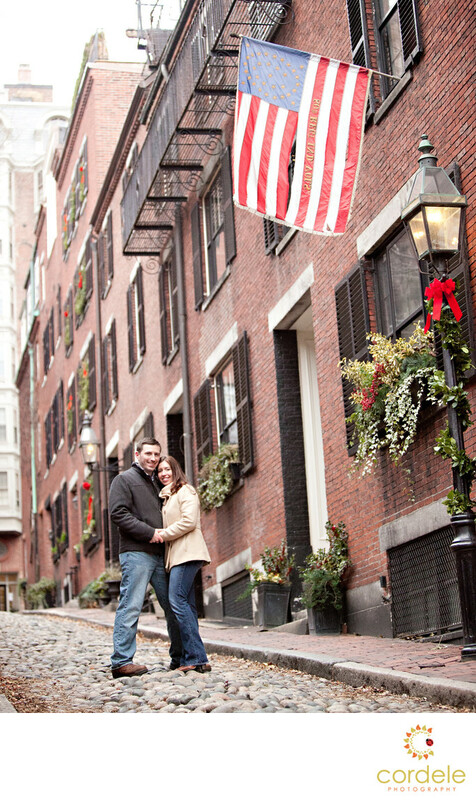 An Engaged couple on Acorn Street taking engagement photos in Boston can be cliche, but it's so pretty! Acorn Street is one of the most amazing places to shoot couples in Boston. Acorn Street is actually one of the most photographed places in the state of Massachusetts. This is very Boston. It has the cobble stones, the American Flag, and the brick work. You also can't forget the amazing street lights. I think these have since been converted from gas to electric.Nestled right in the heart of Beacon Hill. It's not the most easy to get to spot by car, so it's best you go on foot! I have found Acorn street (nestled right in the heart of Beacon Hill) provides a fall backdrop when people are wearing jeans and boots. It's a cute stop for anyone walking around Boston, looking for Cheers! Location: Acorn street Beacon Hill, MA.